We want to send out a special thanks to Mover Rich of the Imagination Movers for recording a bumper for us. Speaking of moving your imagination, our kids have really been showing interest in the Sci-Fi theme lately. They pretend they are either astronauts in outer space or aliens from another world looking for a way to "phone home". Their story lines are out of this world! What type of stories do you create using your imagination? apparatus: any complex instrument or mechanism for a particular purpose. pursuit: an effort to secure or attain. 2. 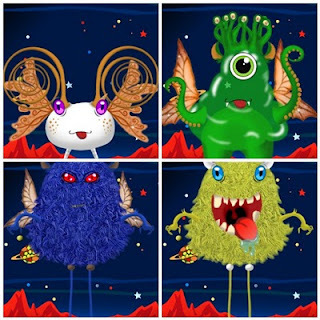 Create your own martian by using this free printable page, "Make Your Own Martian". Send us your creation to nightlightstories@gmail.com or post them on our Facebook page. 1. What does the family use to disable the first ship? 2. What did the boy find on the car when they arrived home? 3. Who gave each other a high five in the car? 4. Why were the aliens in pursuit of the family?